Published on March 22, 2018. Now, let’s go and see some of the end results of these brew days. 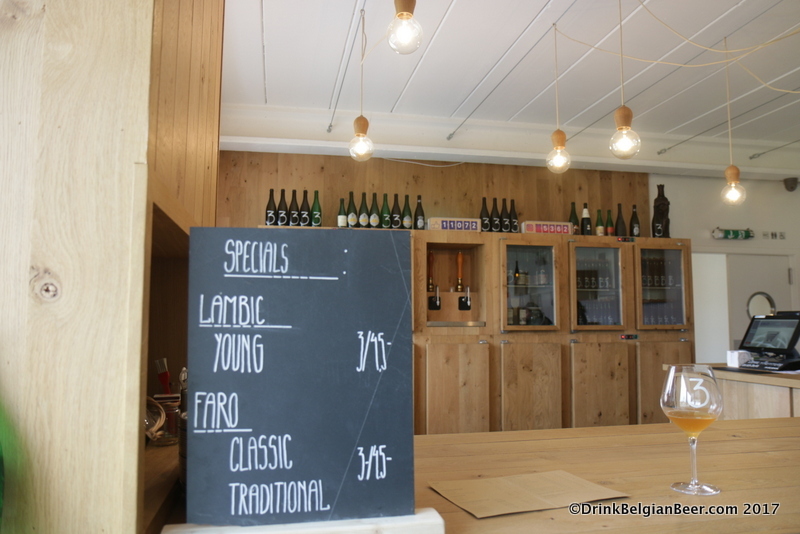 A visit to the tasting cafe, de lambik-o-droom, is a must do, and, fortunately, there is plenty of time during the long brew day to sample a few of the world class lambic beers on site. 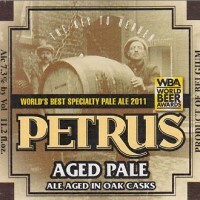 I caught a ride in the truck hauling the wort from Beersel to Lot, and headed into the cafe around noon. 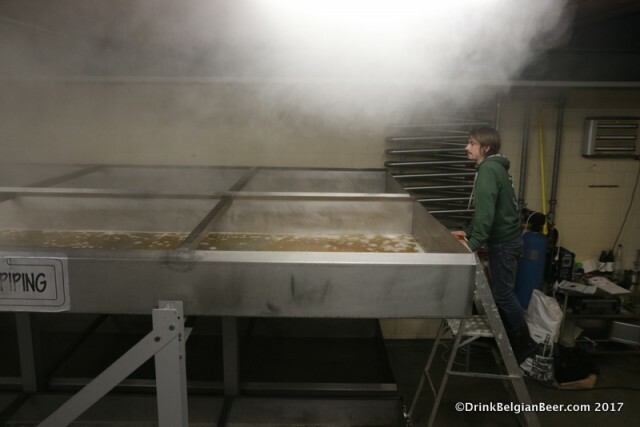 During this time, there is a several hour lull in the action while the boiling of the wort is taking place. A view from the entrance of De lambik-o-droom in Lot. 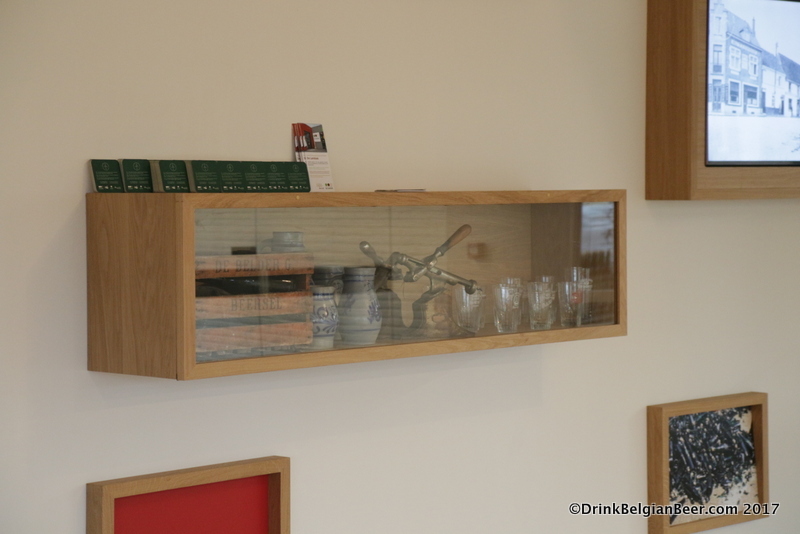 A display case of old 3 Fonteinen breweriana inside the lambik-o-droom. 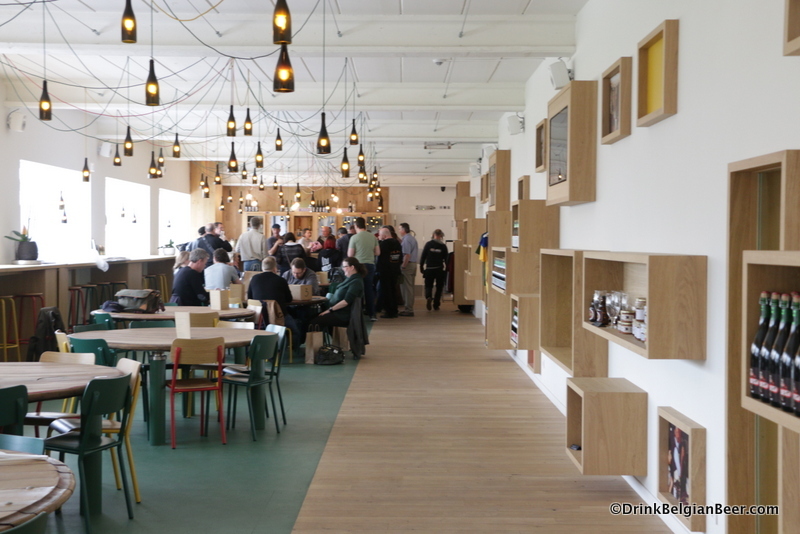 Another view inside de lambik-o-droom cafe. The retail (take away) shop is at the end of the hall. 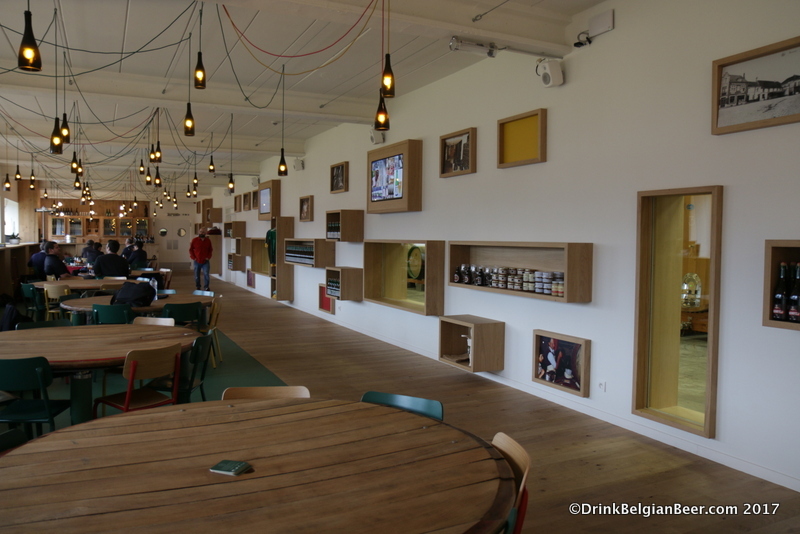 A view of the bar at the lambik-o-droom cafe in Lot. 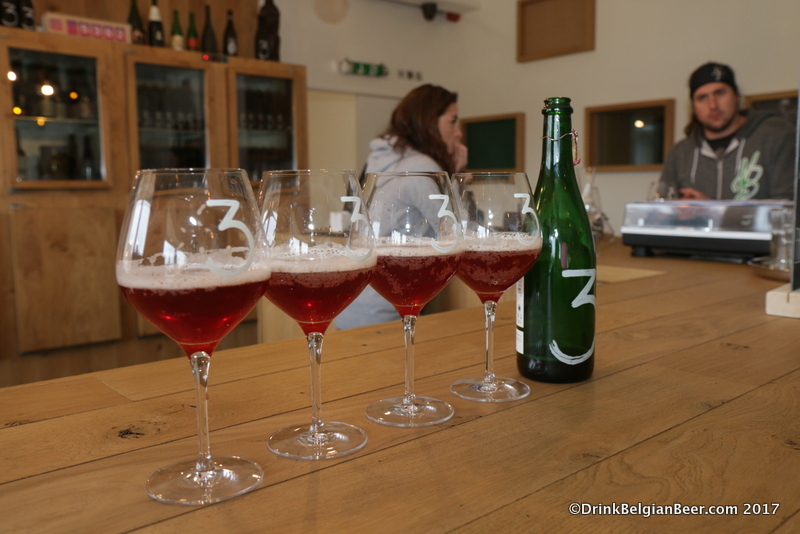 Lambic beer heaven at 3 Fonteinen. 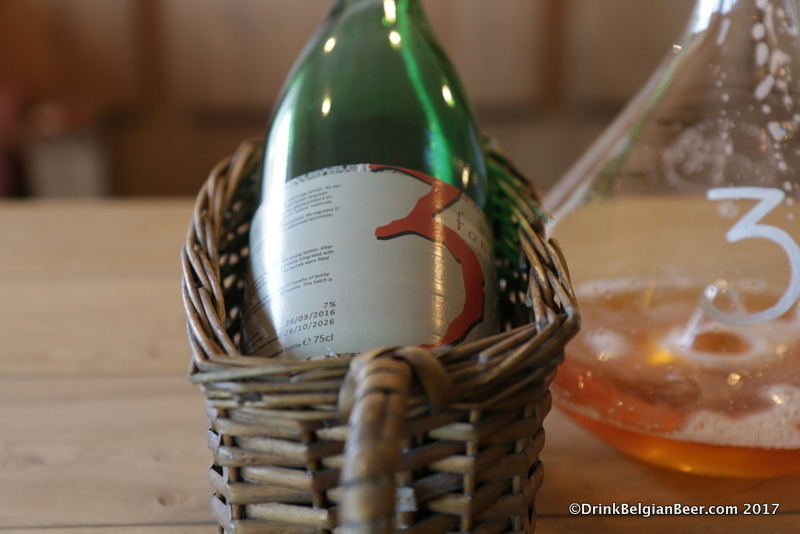 I started my November visit with a glass of young lambic. 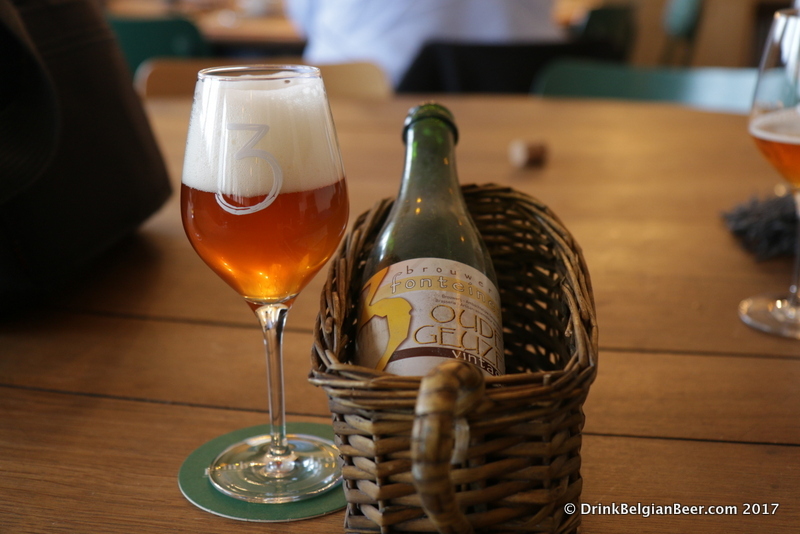 I continued with a 2015 Armand and Gaston Oude Geuze. 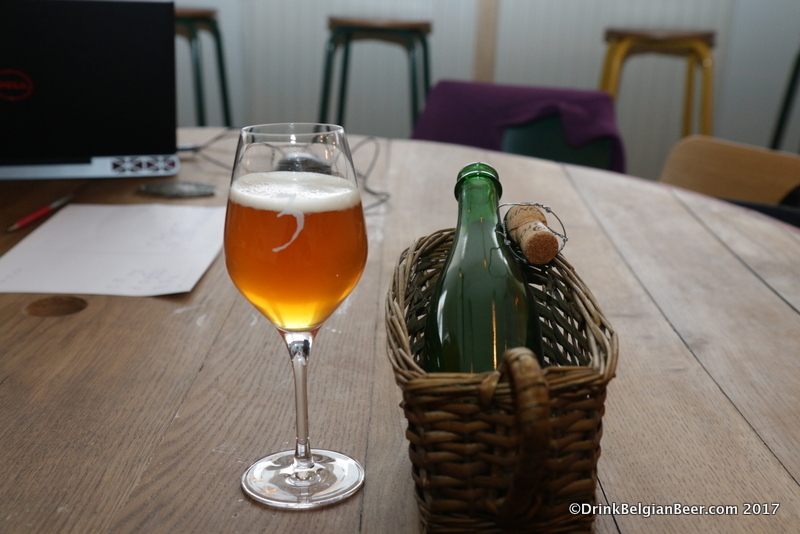 Another shot of the 2015 Armand and Gaston Oude Geuze. 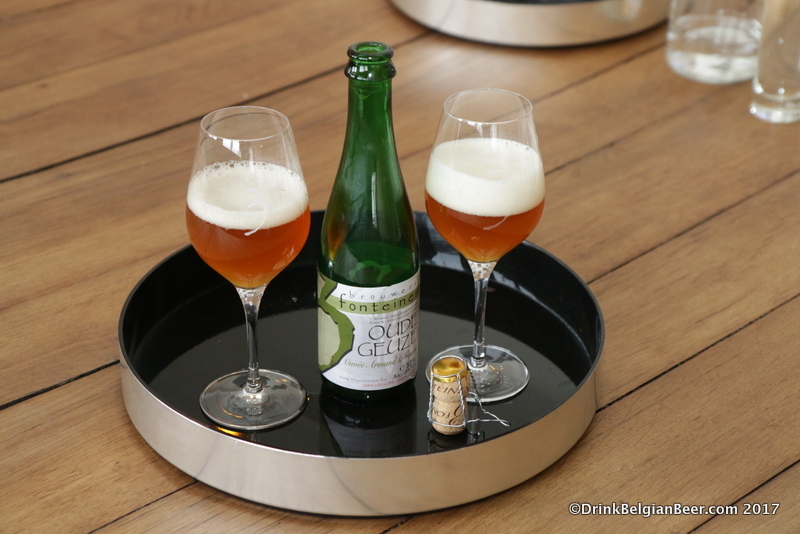 This is a 2012 Oude Geuze Vintage. 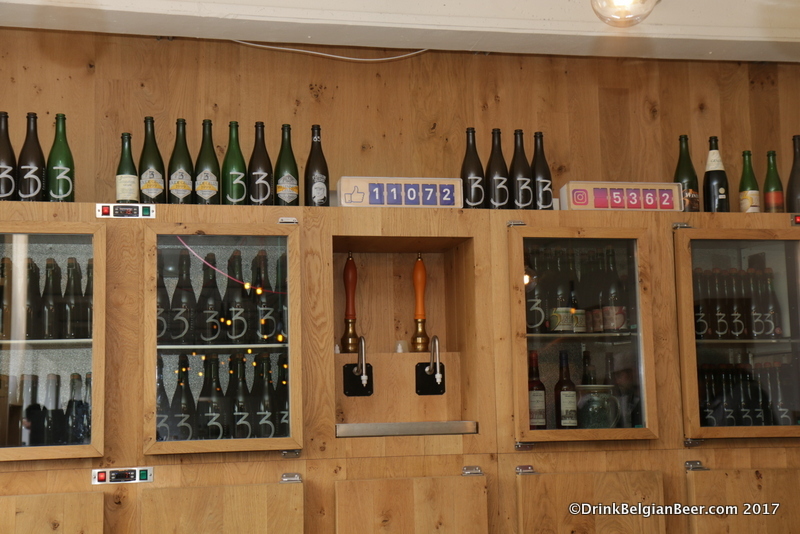 Some of the older beers on offer are served without labels in the cafe, as labels were never applied to many bottles. 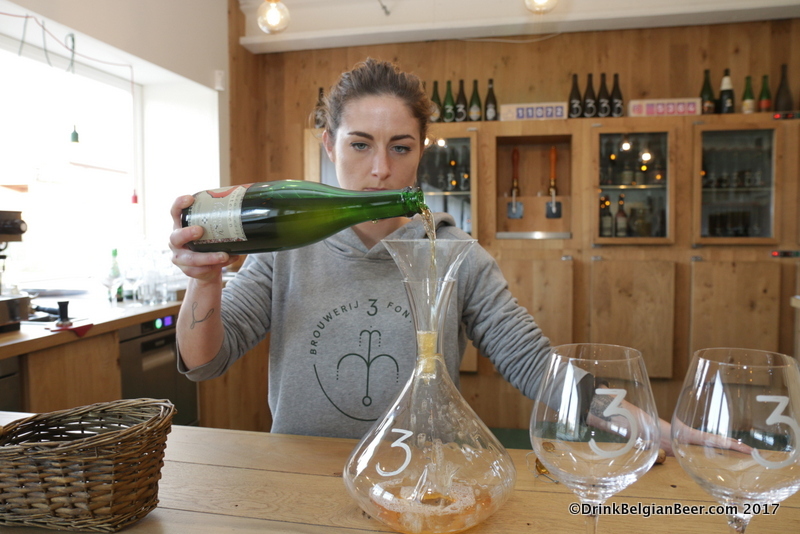 Emelie Maeyens pours a 3 Fonteinen Hommage for a group at lambik-o-droom. 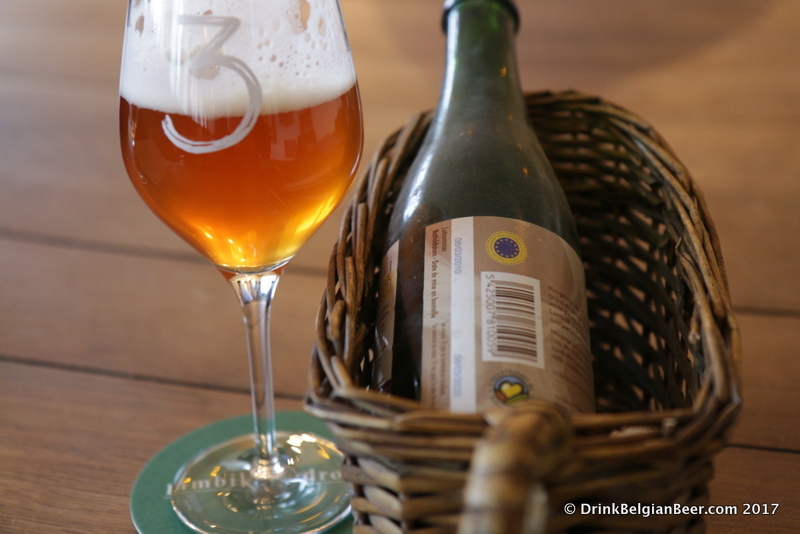 A lineup of 3 Fonteinen Hommage. 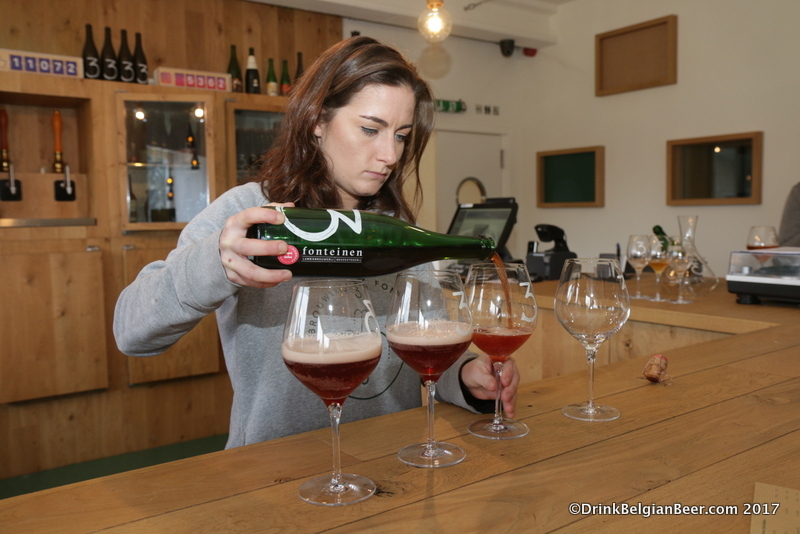 Emelie Maeyens with a perfectly poured glass of 3 Fonteinen Oude Kriek. 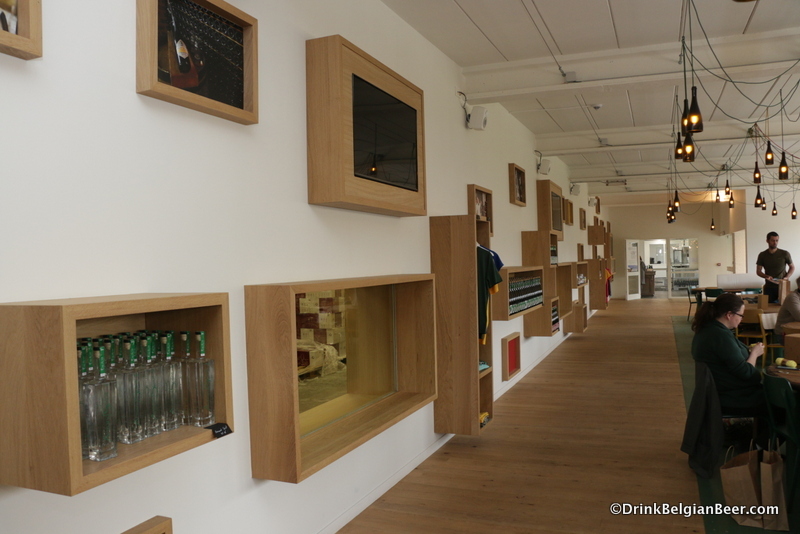 You can see into a bottle cellar from the tasting cafe. 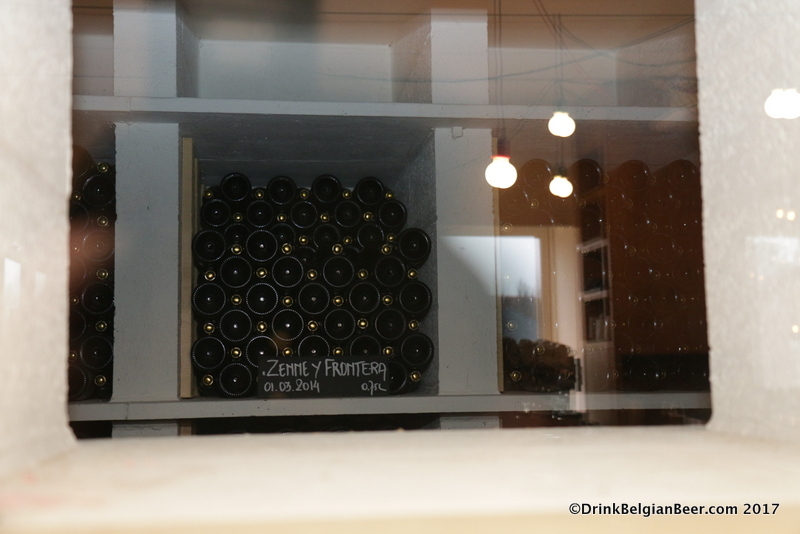 Here, bottles of the much-loved Zenne y Frontera rest. 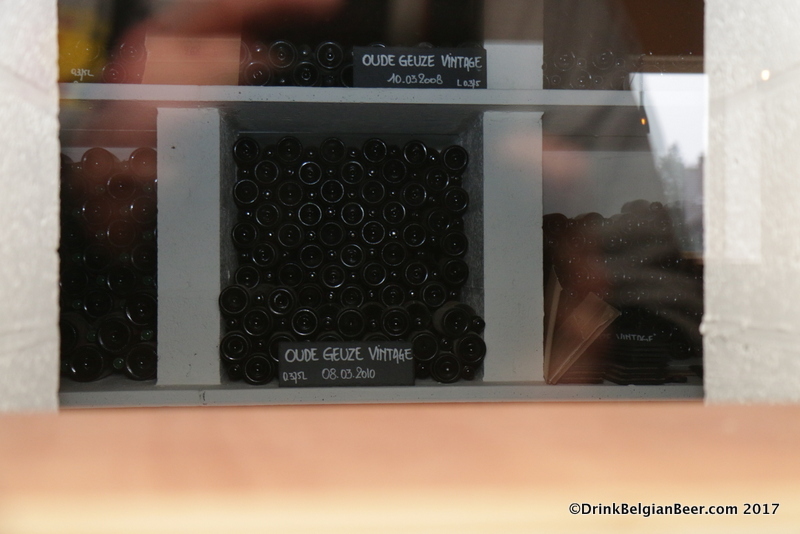 Bottles of Armand 4 Oude Geuze, Lente variant, from 2010. Zenne y Frontera, batch 2, also known as Solera. 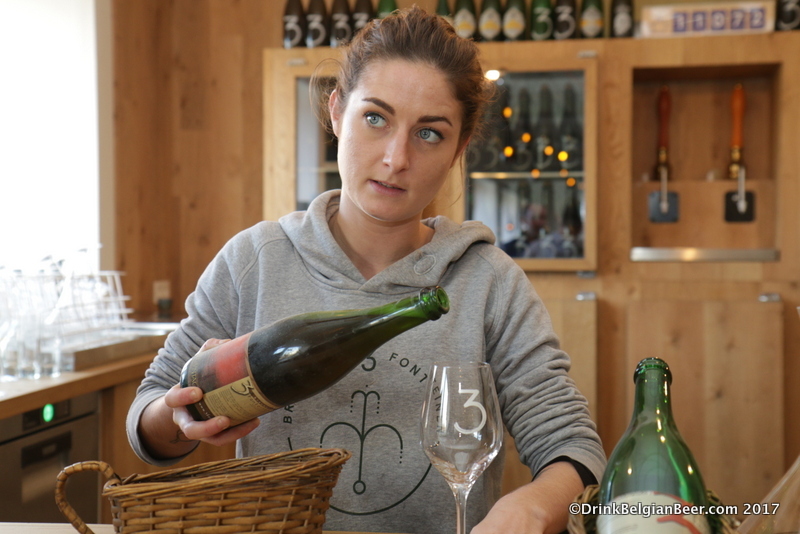 Emelie Maeyens preparing to decant a 2016 3 Fonteinen Zenne y Frontera, batch 2. 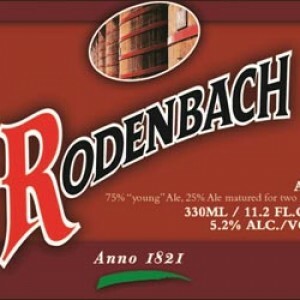 Also known as Solera. 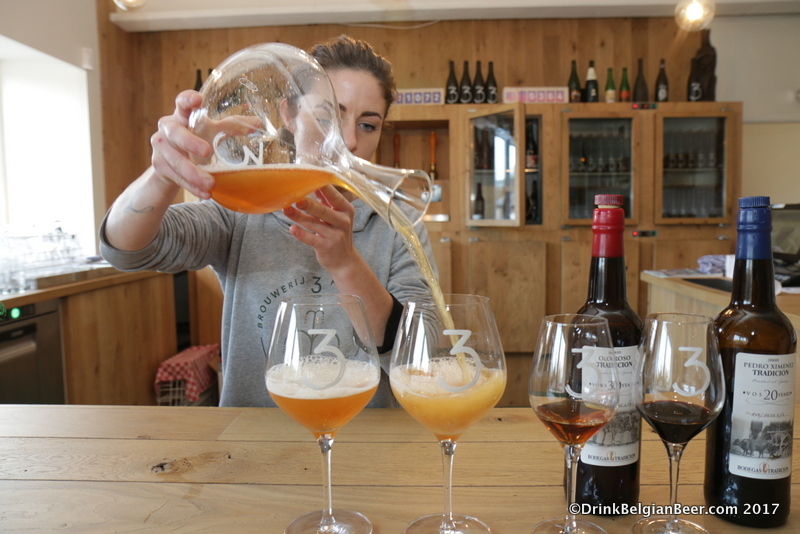 Emelie Maeyens decanting the Zenne y Frontera. 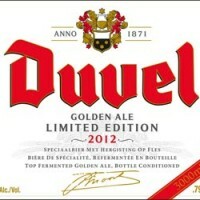 The beer is run through a funnel to aerate it before filling the decanter. 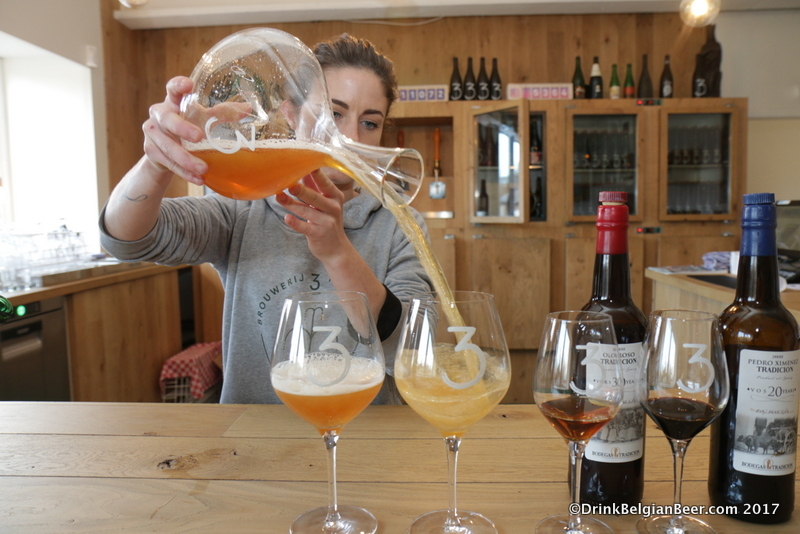 Emelie Maeyens decanting the Zenne y Frontera. 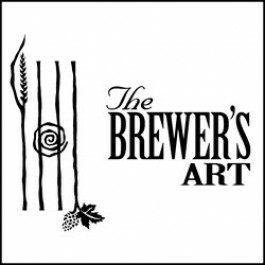 The beer is poured through a funnel to aerate it before it flows into the decanter. 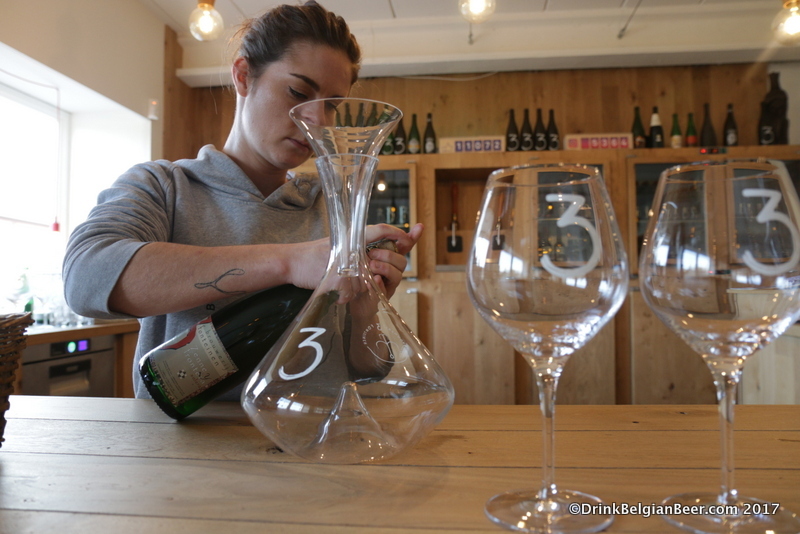 Emelie Maeyens pouring Zenne y Frontera from a decanter into a glass. 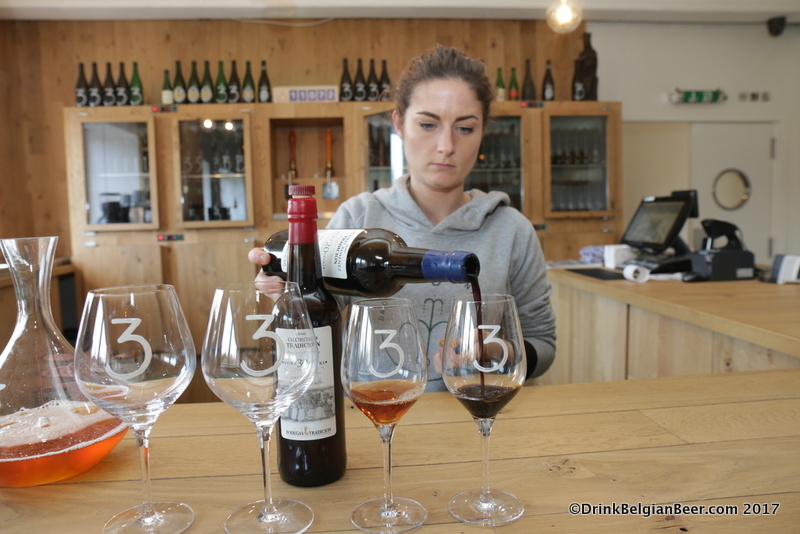 Emelie Maeyens pouring glasses of Oloroso Tradicion and Pedro Ximenez Tradicion sherries, which come with a bottle of Zenne y Frontera. These are amazing sherries! Another decanter shot. 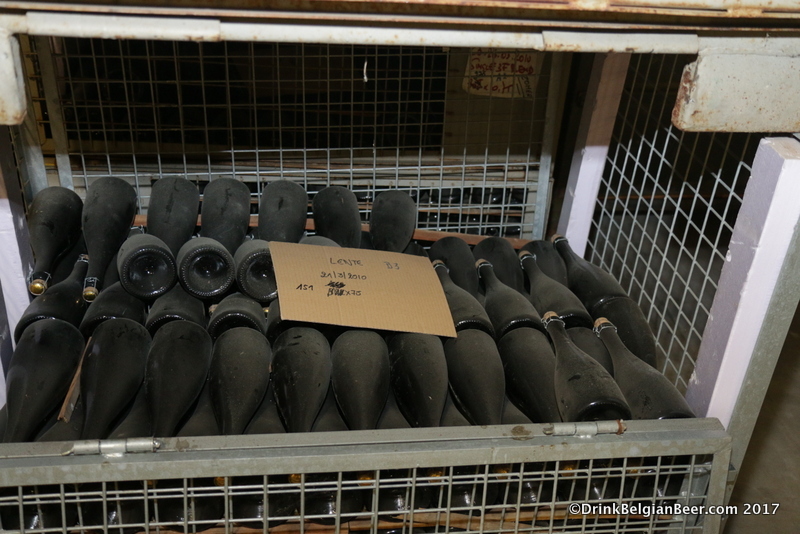 You can see the sherries in glasses to the right. 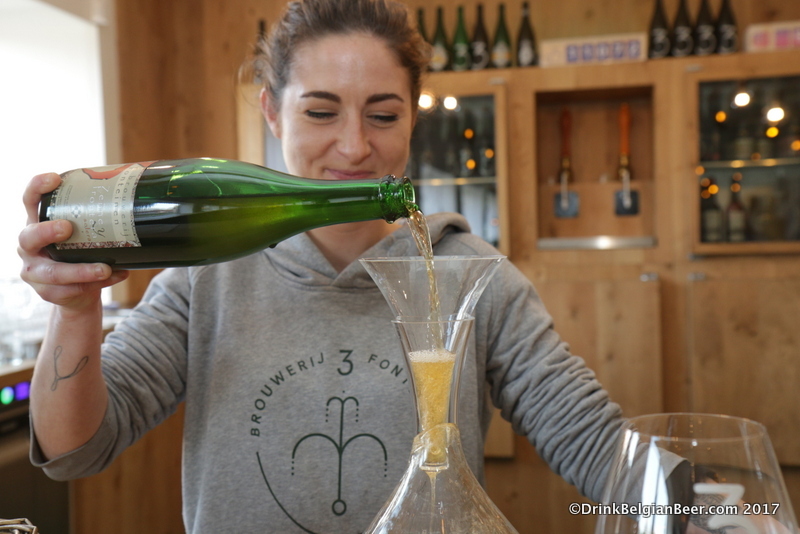 Here, Emelie Maeyens prepares to pour glasses of Oude Geuze Vintage for a group during my visit on November 29, 2017. 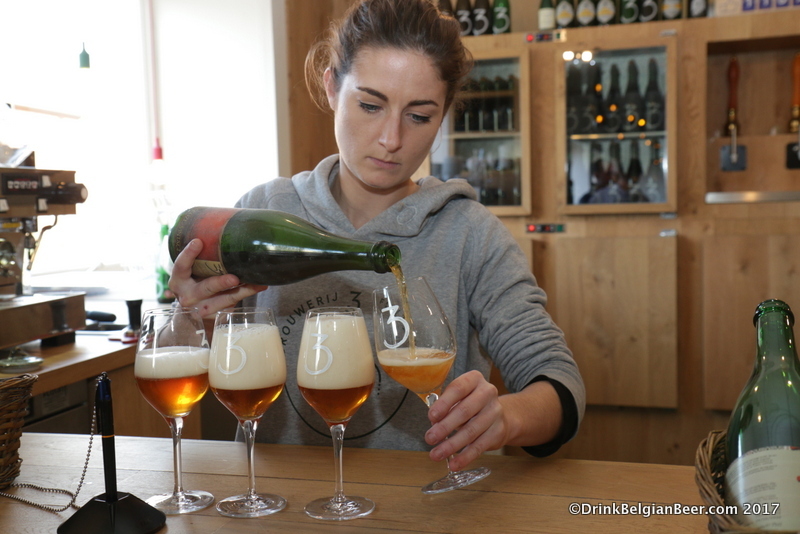 Emelie Maeyens pouring glasses of Oude Geuze Vintage. 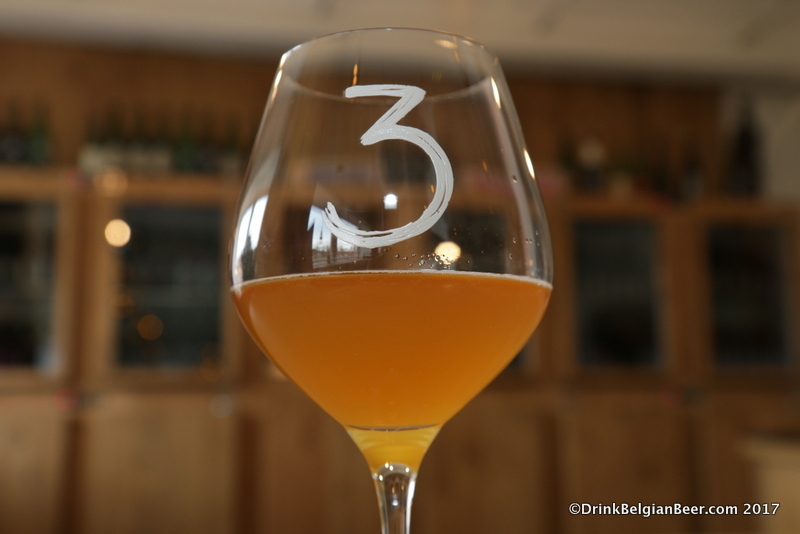 Michael Blancquaert pouring glasses of an experimental 3 Fonteinen peach lambic. 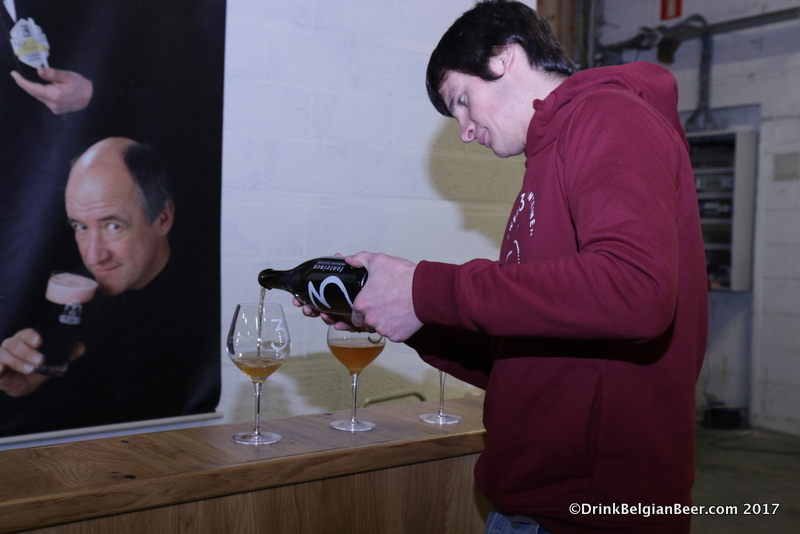 There is a lot of experimentation going on at 3 Fonteinen these days! 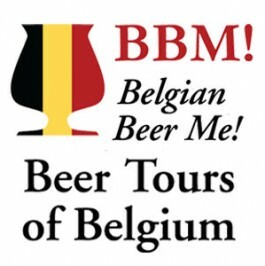 “Twist of Fate” (“Speling van het Lot”) is a series of small batch experimental brews, barrel maturations, fruit macerations and/or blends. 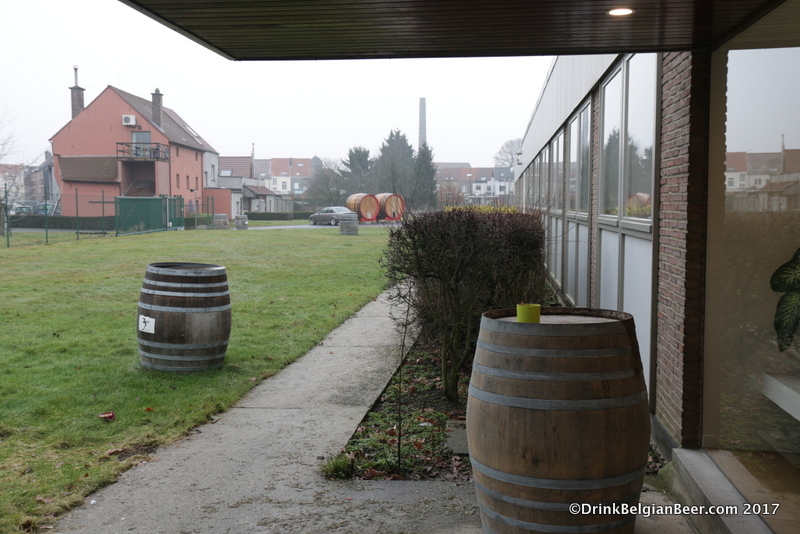 It allows us to enter the lambic playground in our own way. 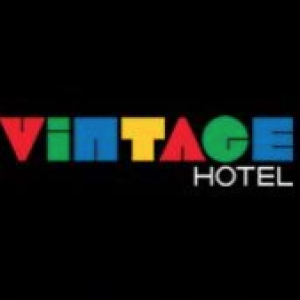 We would like to pop them on Friday the 27th of April and Saturday the 28th of April in our lambik-O-droom (no reservation needed). 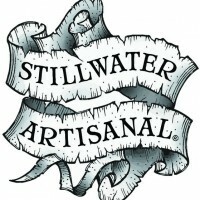 We will soon announce a list of “Twists” available. 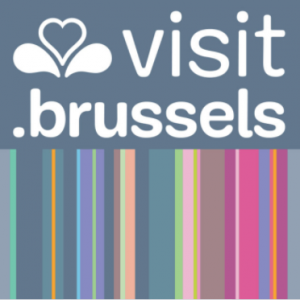 On Friday the 27th of April we will exceptionally be open until 7 PM (instead of 5 PM) and will be chartering a bus to the Night of Great Thirst in Itterbeek. 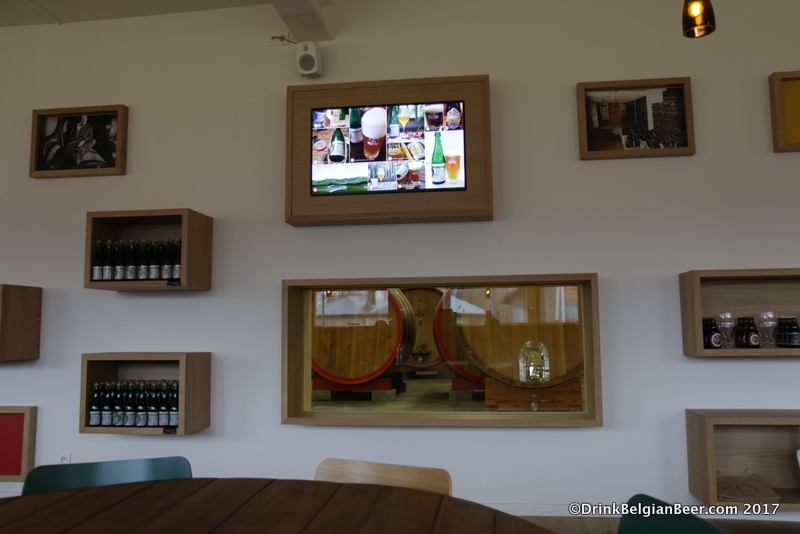 Please send a message to events@3fonteinen.be for more information and reservations. This sounds like a fantastic time to visit the lambik-o-droom! 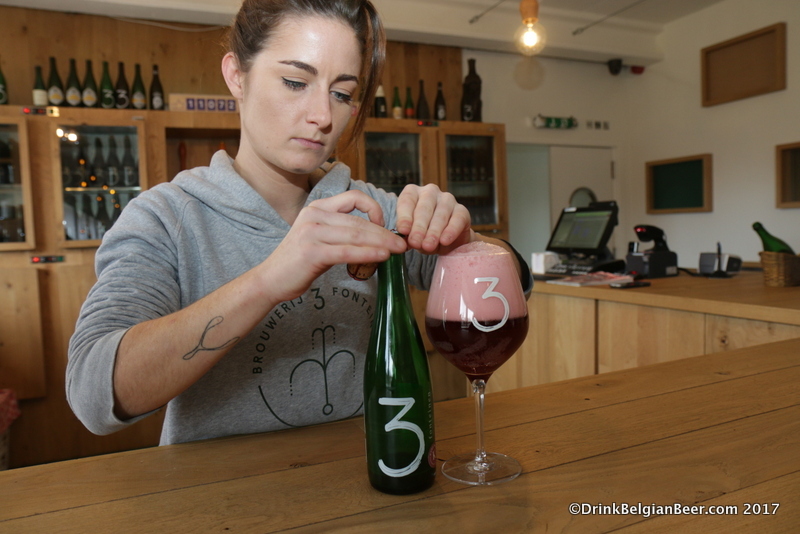 You can see full details on the 3 Fonteinen Facebook page. 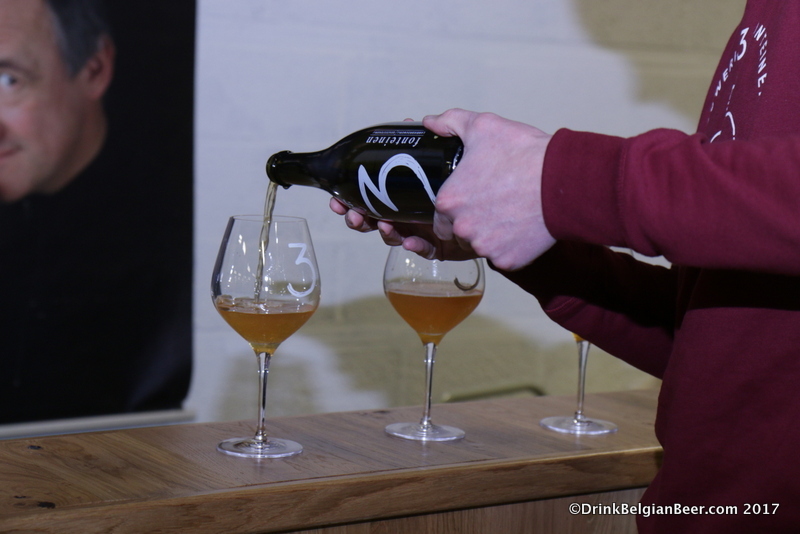 Close up of Michael Blancquaert pouring glasses of an experimental 3 Fonteinen peach lambic. 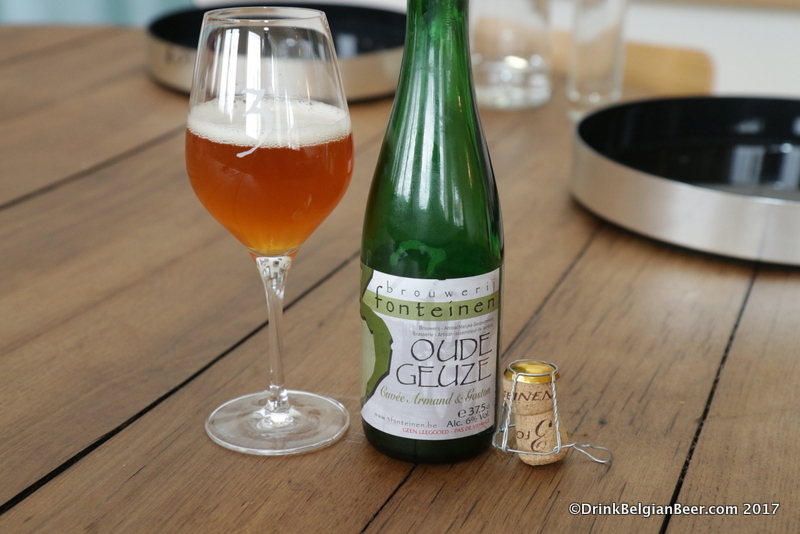 A 3 Fonteinen Oude Geuze Vintage from March 8, 2010. It was perfect: Funky and dry, with a medium tartness. Back label of the 2010 Oude Geuze Vintage. When I returned to the lambik-o-droom on Thursday, November 30, it snowed. 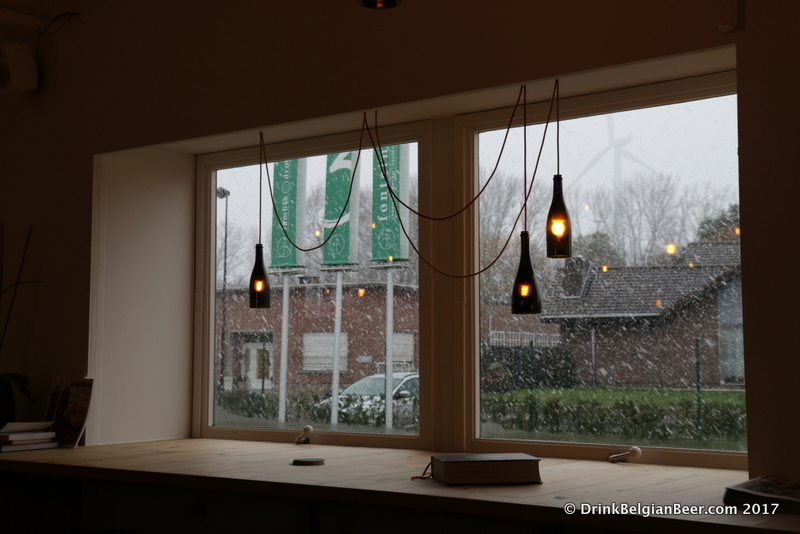 Snow falls outside De lambik-o-droom in November 2017. 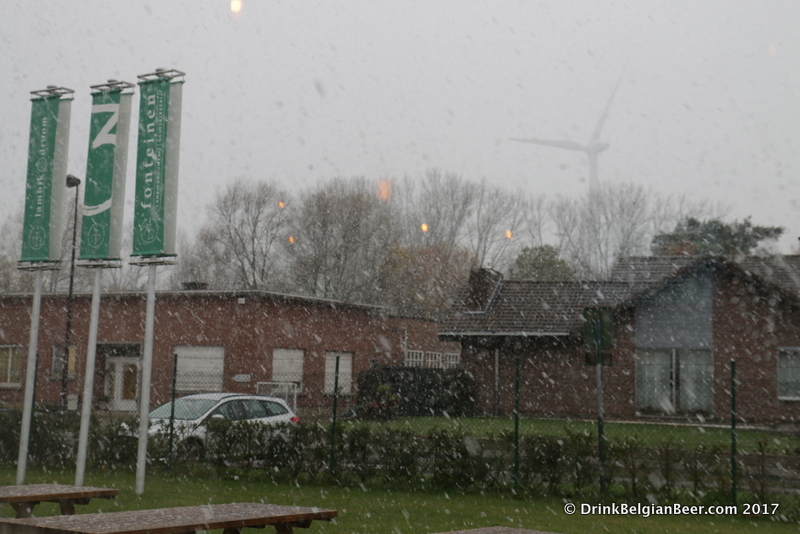 Snow falls in Lot, Belgium, on 30 November 2017.